And this to the very end. Our entertainment company Feel The Sound Productions, (about-us) with Music In Motion DJs, (website) the Home of The DJ/MC Interactive Showroom, a “real” experienced Disc Jockey wedding/event Team, supplying Karaoke, (Sing-A-Song-or-Sing-Along) Décor LED ambient wall up-lighting, (photo-gallery) our specialty DRY-ICE “dancing on a cloud” for the Wedding First Dance, together with Feel The Moment Photography, (packages) Snap Shot PHOTOBOOTH entertainment company says Thank You to Mr. & Mrs. Bloomberg for hiring Us, the True Professional Wedding and Event Specialist’s:-) We are very Happy you loved the pictures and we are very humble to be part of such an amazing successful wedding. Mathew House in Cary, NC is a Historic event venue with a modern look to it. COST? 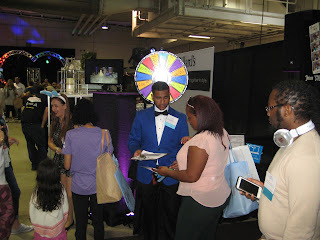 FREE but you have to REGISTER and by Registering YOU enter to WIN Prizes, Raffles, and Awesome Give-aways through-out the Bridal Expo! Learn about the latest wedding trend "Dancing On a Cloud" for your First Dance. In fact our brochure that you will receive Features the Doubletree with Bride/Groom dancing on a cloud as we are a Preferred Vendor of the Doubletree. Preferred Vendor = a venue and/or Banquet Manager who highly recommends our entertainment company and we do the same in return. You don't want to miss this opportunity if you are considering marriage, already engaged, or simply planning a special event as this show will be huge and full of ideas to plan that perfect wedding/event. The Doubletree too is a convenient as well as an elegant modern space to hold any type of event including your wedding so be sure to take advantage of the TOUR! with Feel The Sound Productions, (about-us) with Music In Motion DJs, (website) the Home of The DJ/MC Interactive SHOWROOM, a “real” experienced Disc Jockey wedding/event TEAM, supplying Karaoke, (Sing-A-Song-OR-Sing-Along) Décor LED ambient wall up-lighting, (photo-gallery) our specialty DRY-ICE, “dancing on a cloud” for the Wedding First Dance, together with Feel The Moment Photography (packages) and Snap Shot PHOTOBOOTH entertainment company. We say Thank You to Mr. & Mrs. Massey for hiring our entertainment company - the Wedding and Event Specialist’s - to provide for your wedding ceremony and fun reception! To conclude Mr. & Mrs. Massey ended the wedding with a spectacular sparkler exit thus pausing under the sparklers to give each other a smooch. The Moser Barn, https://www.facebook.com/The-Moser-Barn-1902728263284353/ - located in Ramseur, NC is a breathtaking view from all angles of miles and miles of scenic country views, the Moser Barn itself sets the theme for a beautiful rustic wedding. When Mr. & Mrs. Massey got married in the breathtaking country-side fields of the Moser Barn, they then held their fun-filled wedding celebration inside the beautiful rustic Moser Barn and they added "dancing on a cloud" for a First Dance and this for All to remember a spectacular First Dance as well as a "sparkler" exist and everything in-between including "hands up in the air" from all the Guests to the Bride-N-Groom all night long from - who all night long couldn't get off the Dance Floor because Feel The Sound Productions, (about-us) with Music In Motion DJs, (website) the Home of The DJ/MC Interactive SHOWROOM, a “real” experienced Disc Jockey wedding/event TEAM, supplying Karaoke, (Sing-A-Song-Or-Sing-Along) Décor LED ambient wall up-lighting, (photo-gallery) our specialty DRY-ICE “dancing on a cloud” for the Wedding First Dance, together with Feel The Moment Photography, (packages) and Snap Shot PHOTOBOOTH also in attendance was supplying the Entertainment Services. Today we Blog/Post about their successful and beautiful country-side view wedding ceremony with the Bride/Groom putting up their Victory Sign "hand in the air" yelling; "We Did It! supplying Karaoke, (Sing-A-Song-or-Sing-Along) Décor LED ambient wall up-lighting, (photo-gallery) our specialty DRY-ICE “dancing on a cloud” for the Wedding First Dance, together with Feel The Moment Photography, (packages) and Snap Shot PHOTOBOOTH supplied our services for both the wedding ceremony as well as the Fun/Exciting wedding reception this past Fall. 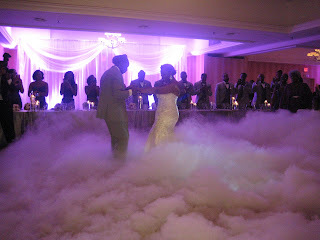 and we will share all the successful wedding reception pics in tomorrow's Blog/Post. Feel The Sound Productions, (about-us) with Music In Motion DJs, (website) the Home of The DJ/MC Interactive SHOWROOM, a “real” experienced Disc Jockey wedding/event TEAM, supplying Karaoke, (Sing-A-Song-Or-Sing-Along) Décor LED ambient wall up-lighting, (photo-gallery) our specialty DRY-ICE “dancing on a cloud” for the Wedding First Dance, together with Feel The Moment Photography, (packages) and Snap Shot PHOTOBOOTH says Thank You to Mr. & Mrs. Chung for hiring our entertainment company, the Wedding and Event Specialist’s to supply for your Wedding Ceremony and Reception!